The four women mission groups of our church are now called “Global Women.” Global Women, a ministry organization that connects with Christian women in some of the neediest countries in the world, is partnered with Cooperative Baptist Fellowship (CBF). You will find more information about them at http://globalwomengo.org. What is missions? It is reaching out beyond ourselves to inform and serve. To learn more, contact the leaders of one of these groups or ask Rev. Lauren Jones Mayfield, staff liaison for Missions. The four Global Women groups of Highland Baptist Church meet regularly to study, do and support missions. New members are invited to participate. The group with the longest history is named for retired missionary/former member of Highland, Jean Janes. The Jean Janes Global Women Group meets on the second Monday evenings monthly except for July and August. The next scheduled meeting is November 14, in Fellowship Hall, to complete an annual project, decorating 100 felt Christmas stockings which will be filled with toys and candy for children of incarcerated women. At the same meeting, some of the members will pack toys and personal needs in plastic shoe boxes for fourth grade boys in McCreary County, Kentucky. The group leader, Marilyn Tucker, is a former music teacher. to hear about work of the CBF along with projects around the city, such as Supplies Over Seas (SOS), Wayside Christian Missions and Highlands Community Ministries. The women give and serve in these places. Child care is provided since this group has a wide spread of ages. Leader, Gloria McBee is energetic and creative. The Prayer Shawl Global Women Group meets twice a month, on the first and third Thursdays, 7:00 p.m., at the Food Court in Mall St. Matthews, to crochet and knit gifts for persons undergoing stress or grief. The shawls and small afghans are evidence of prayers for the recipients. Larger pieces are now being made for the refugee family from Congo. 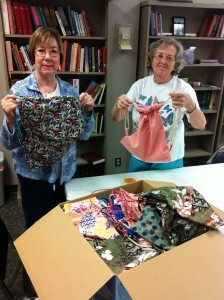 Leader, Lela Hendrix, a skilled crafter, introduced Prayer Shawl ministry soon after joining Highland. The Highland Book Ends book club meets on the last Thursday of each month, at 2:30 p.m., in room 103, to discuss literature suggested by the CBF. For example, they recently discussed Katrina, a book about rescue and recovery work after the notorious hurricane in New Orleans. Leader, Pat Wells is a retired reading specialist in public schools. Further, Global Women and the Global Missions Ministry Group of Highland promote and sponsor the annual CBF Global Missions Offering in late spring. More details will be forthcoming. If you would like to receive CBF “Mission Bites”—a weekly e-update from mission field personnel, sign up here. We give thanks for the vibrant ministries each of these four global women mission groups afford our church! If you are interested in learning more about Women’s Mission Circle Groups, contact Marilyn Sanders.